Praja Rajayam Party (PRP) chief K Chirajeevi and many other senior party leaders were arrested here today when they staged a dharna outside the Andhra Pradesh Industrial Infrastructure Corporation (APIIC), demanding a CBI probe into its controversial land deals in the last six years. Addressing the dharna, Mr. Chiranjeevi alleged that thousands of acres of land was given away to industrial houses and real estate developers in total violation of rules. He cited the EMAAR properties land deal which was supposed to have caused a loss of several thousands of crore of rupees to the Government. Mr. Chiranjeevi demanded that an inquiry by CBI be ordered into the land deals to unearth the truth and those responsible for the dubious deals be brought to book. Mr. Chiranjeevi and other PRP leaders tried to enter into the APIIC building to submit a memorandum to the authorities concerned but were prevented by police. In fact, police asked Mr. Chiranjeevi not to take part in the agitation as there was a possibility of attack by activists of the Telangana Students Joint Action Committee. However, Mr. Chiranjeevi ignored the police plea and took part in the agitation asserting that he would not be cowed down by such threats. 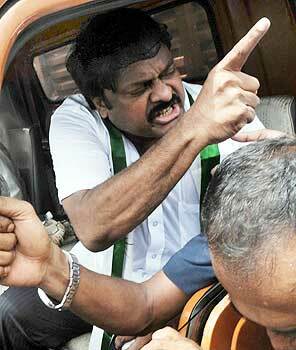 Soon after his arrest Mr. Chiranjeevi was immediately driven away in a police jeep to a near-by police station. Senior party leaders P Ramachandraiah, D T Naik, P Vedavyas were amongst the others who took part in the agitation.